This is a dominating building that clearly illustrates the history and importance of the Motor City. Detroit was the fastest growing large city in the United States in the 1920s thanks to the booming vehicle industry. By 1930, its population reached 1.6 million. Only New York, Chicago and Philadelphia were larger. If you had extrapolated demographic and economic trends based what occurred in the 1920s, you would have predicted that Detroit would soon surpass Philadelphia to become the third largest city. In the late 1920s, much of the northern and northwest sections of the present city of Detroit were vacant lands so there was very much room for a half million or more additional residents. No one foresaw the Depression and the way it would curtail growth in Detroit. Nor did people appreciate how federal housing policies in the 1940s would promote rapid suburban growth. By 2017, the city’s population had fallen to less than 40 percent of what it was two generations earlier. City tax revenues grew in the 1920s and governmental officials used those monies to erect impressive government buildings. The structure you see here is a tremendous example. The first floor was devoted to the fire trucks that provided protection to much of the downtown area. The floors above housed the many offices of bureaucrats who administered what was, likely, the fourth largest fire department in the nation. Along Larned, you see four large arches with doors that allowed the fire trucks to enter and leave. Along Washington Boulevard, there are three similar large arches for the entry and departure of trucks. This building was completed in 1929. The city’s fire department retired their last horses seven years previously so this was among the first Detroit fire houses designed without facilities for horses. The building is a massive and rich with decoration. Perhaps the architect wished to convey the message that Detroit residents were safe because of their fire department’s strength and devotion. By 2011, this building no longer housed fire fighters and fire equipment. 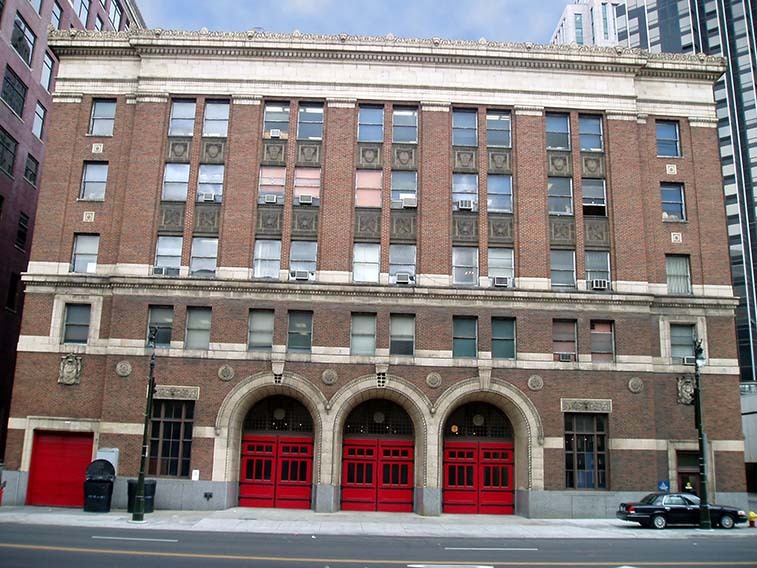 However, it continued to be the administrative headquarters of the Detroit Fire Department. In 2010, the city began construction on a new location for the administrative offices of the police and fire departments. In 1974, the Internal Revenue Service constructed a building near Third and Michigan that was subsequently used as the temporary home of the MGM Grand Casino. MGM left that building when their new casino opened in 2007. Detroit city officials had been seeking a new administrative building for the police and fire departments for some time and eventually settled on a renovation of the former MGM Casino building. In early 2013, the city announced that the building you see would be sold to a group of investors headed by Walter Cohen of Southfield who was responsible for the updating and modernizing of the Park Sheldon Hotel in Detroit’s Cultural Center. The reported price was $1,250,000. The investors plan to work with the Aparium Hotel Group to create a boutique hotel with about 80 guest rooms and intend to open a Cajun restaurant at the street level. Nearby Cobo Hall is scheduled to reopen in summer 2013 after a $300 million renovation. Increased activity at Cobo Hall will likely generate a need for more hotel rooms. The nearby Pontchatrain Hotel, after being closed for about four years, was purchased by a Mexican heddge fund, remodeled and reopen as a Crowne Plaza Hotel in 2013. The remodeled Detroit Fire Department Headquarters opened as the Detroit Foundation Hotel in May, 2017. This is the second botique hotel to open recently in downtown Detroit. Three years ago, the remodeled David Whitney building at Grand Circus Park opened as the city's first such hotel. In 2018, two more botique hotels are slated to open in Detroit, one in former Metropolitan Building at the corner of John R and Farmer and the Detroit Shinola Hotel in the 1400 block of Woodward. The new owner of the Herman Keifer hospital also plans to open a botique hotel in that structure. Hans Gehrke was a productive and creative architect working in Detroit before World War II. He began designing upscale homes for such neighborhoods as La Salle Gardens and Grosse Pointe in the pre-World War I period. He may also have designed some of the elegant homes in the Sherwood Forest historic neighborhood. He was the architect for the 1914 the modernization of the Saint-John-St. Luke Evangelical Church designed by Julian Hess that visitors to the Eastern Market see frequently but may not fully appreciate because of its location on Russell east of the marker. Hans Gehrke won commissions to design many or most of the fire houses built by the City of Detroit in the 1920s as well as fire stations in neighboring communities including one in Royal Oak. His Detroit Fire Department Headquarters may be his greatest accomplishment. Unfortunately, I know of no biography of this architect nor a list of the numerous structures he designed.